"This filling and satisfying salad with a Mediterranean twist makes a nice lunch or the perfect side to accompany grilled fish or chicken. Freekeh is low in fat and high in protein and fiber, making it a great alternative to quinoa or rice." Stir freekeh in a medium-sized saucepan over medium-high heat until lightly toasted and fragrant, about 3 minutes. Add broth and bring to a simmer. Cover pan and cook until water is absorbed, about 20 minutes. Remove from heat and let stand 5 minutes. Transfer freekeh to a bowl to cool. Meanwhile, whisk vinegar, tahini, and honey together in a small bowl. Slowly drizzle in olive oil and whisk until combined. Season with salt and pepper. 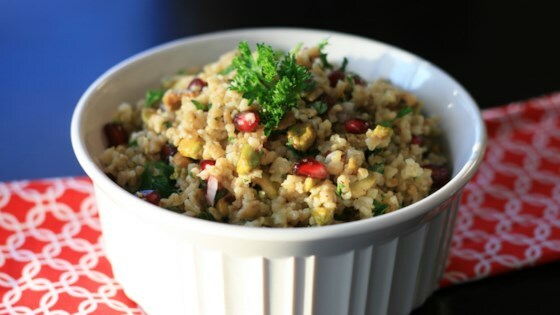 Add pomegranate seeds, onion, mint, and parsley to the bowl with the cooked freekeh. Drizzle in the dressing and toss to coat. Season with additional salt and pepper, if desired. Refrigerate 30 minutes. Top with pistachios right before serving so they don't soften. Feel free to use vegetable broth in place of chicken broth to make it vegetarian. This salad can also be served at room temperature.